Welcome to #testkitchen – where I find random recipes on the web worth working on 🙂 Customizing other recipes helps you to learn how to make your own to fit your nutritional needs. Things can fall apart (literally) when you start to adjust the techniques of a recipe. So start with seasoning, it’s much easier to recover in case something goes wrong. After you make it a few times adjust the texture to your liking. Be sure to let us know how your dish turns out! Join the Live Tribe on Facebook to join the conversation and follow me on Instagram for food-spiration. 1) In a coffee grinder, or high speed blender, grind caraway seeds as well as the flax seeds. 2) Process all bread ingredients in a food processor until well combined. 3) Spread dough onto two ParaFlexx sheets (parchment paper works, too) and dehydrate for about 12-16 hours on 105 degrees. What works best is to dehydrate overnight, and in the morning flip the bread and continue dehydrating without the ParaFlexx. When the bread reaches your preferred consistency, keep any extra in a sealed glass container (or BPA free plastic), so you can use it for later meals. 1) To make the herb cream cheese, process cashews, lemon juice, and salt in a food processor until thoroughly combined. 2) Gently pulse in finely chopped garlic, parsley, and basil. 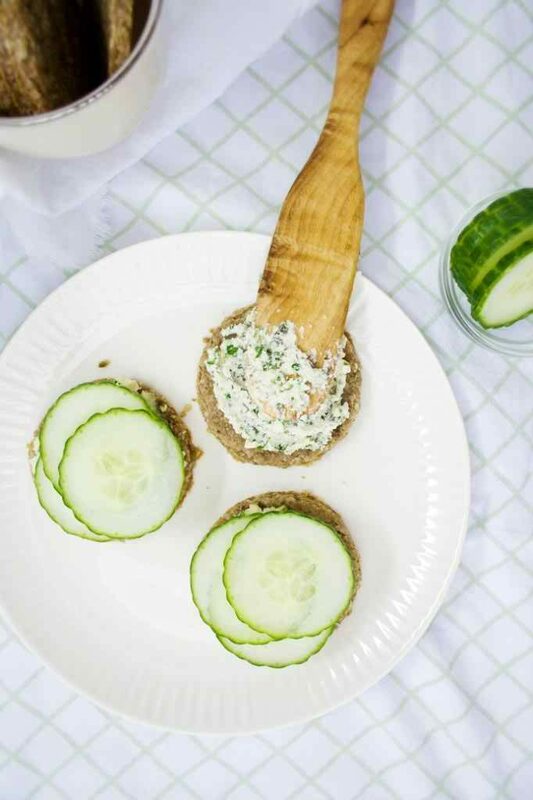 Spread the herb cheese onto a piece of bread, top with a cucumber, and enjoy!